Here we go! 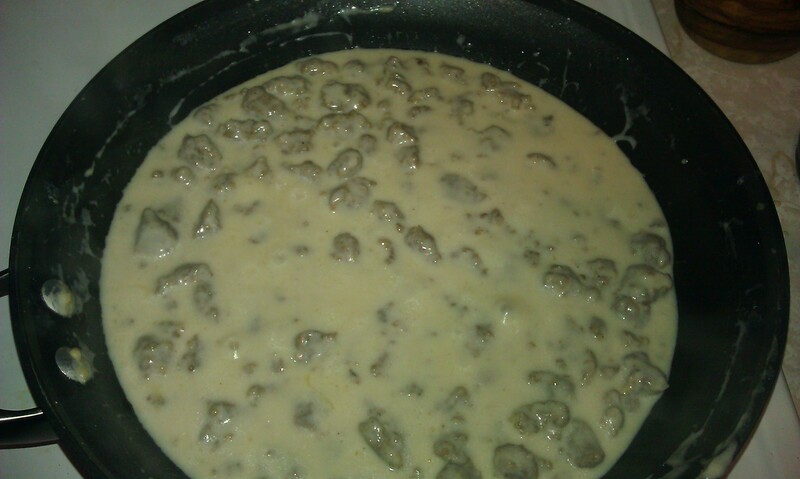 The first thing I ever learned to cook…biscuits and sausage gravy! This dish is one of my earliest childhood memories and is where I think this blog should start! My grandmother, Bea Fields, who passed away last year, taught me how to make this. She made the biscuits from scratch, with some shortening and flour and milk. It was my job, to add the milk as needed while she formed the dough. Then once she had patted them out and formed them and put them in the pan, my second job was to top each biscuit with a spoonfull of butter so they got golden brown in the oven. YUM! Somewhere there is a photo of me doing this alongside Grandma, but I couldn’t find it this morning. So instead, here is a photo of Bea Fields. I can hear her saying “dadgumit” as I type. 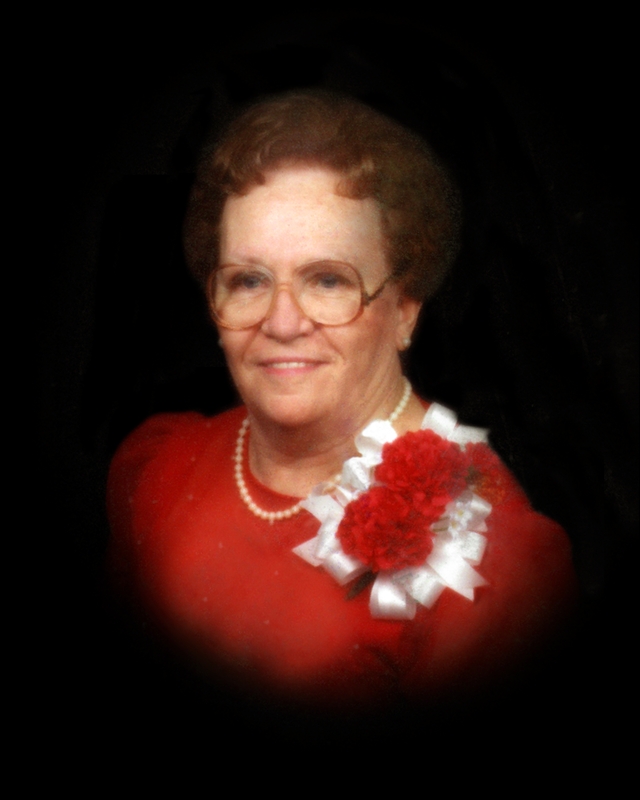 Bea had five children…four boys and one girl, my mother Ginger. She used to make this recipe to feed those kids. When I was a kid, this was (and well quite frankly sitll is) our “special” morning breakfast. We’d eat it at Christmas, birthdays, and the morning of the Indy 500 (which was a holiday in our house). Today…my parents and I both cheat a little bit. 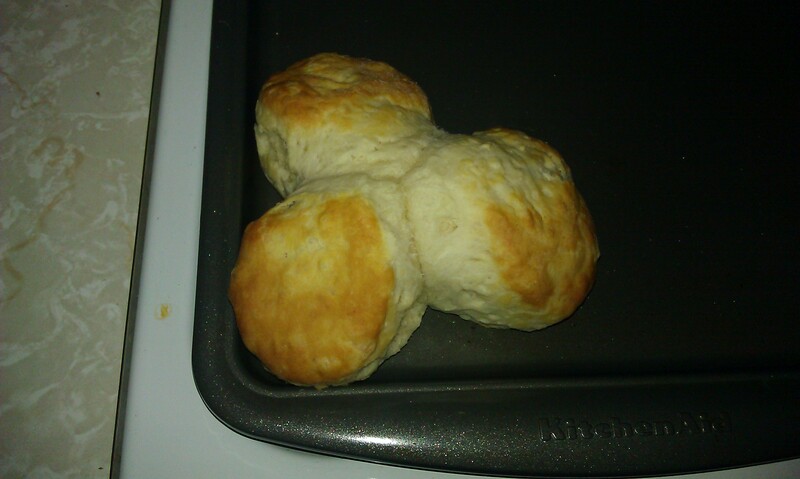 Instead of making the biscuits from scratch like Bea did, we use Pillsbury frozen southern style biscuits. It’s just easier and they are almost as good as Bea’s. Almost. Just follow the directions. Brown 1lb of sausage. Today I used Neese’s country sausage, a local NC company, and it rocked. 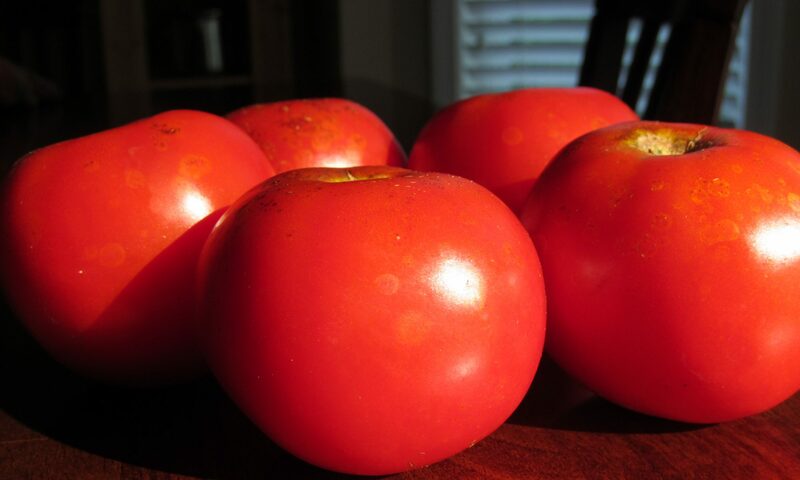 So fresh and full of flavor. A link to their website…http://www.neesesausage.com. Once the sausage is cooked, you essentially make a roux for the gravy. 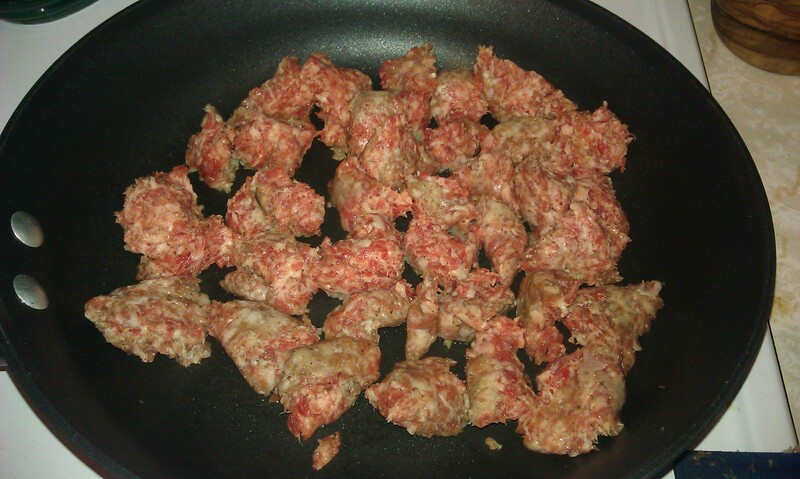 Add some flour to the pan to absorb the grease rendered by the sausage. I know, not the healthiest thing in the world and you are asking…can I use a leaner sausage like Turkey Sausage? The answer is yes. HOWEVER, and this is a big however, you are going to need to add shortening into that pan of turkey in order to make the gravy. So what’s the point? Nobody said this was a low calorie dish and this is a “special” morning. One Christmas, my brother bought turkey sausage for this dish, which my mother and I were making in his kitchen. We added Crisco to the pan, but acted as a team to do it, when he was out of the room. HA! So once you add the flour and a bit of milk, you pan should look something like this. There is no official amount of flour to use, just use your best judgement. You want the flour simply to absorb the grease. It’s going to make your gravy thick. 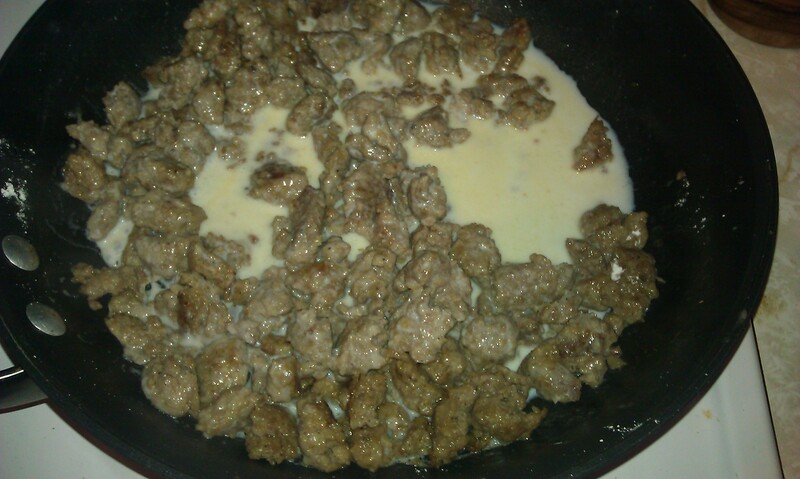 Keep adding milk (I used 2%) as it gets absorbed, and then add a bit more, and a bit more, and a bit more. Really scientific right? Eventually you will get the amount of gravy you want and your desired consitency. Your heat should be about medium. You don’t want to boil it but keep it hot enough to thicken up the gravy. All the while, your biscuits are getting golden brown in the overn. Takes about 20-25 minutes according to the directions. So eventually your gravy (patience is a virtue) will end up something like this. YUM. And you are ready to plate! Now every person in my family does this differently. My mom, splits her biscuits in half, only puts gravy on one, and puts orange marmalade on the other. My dad, splits his, puts butter on the biscuits, and then puts gravy on them. Me? 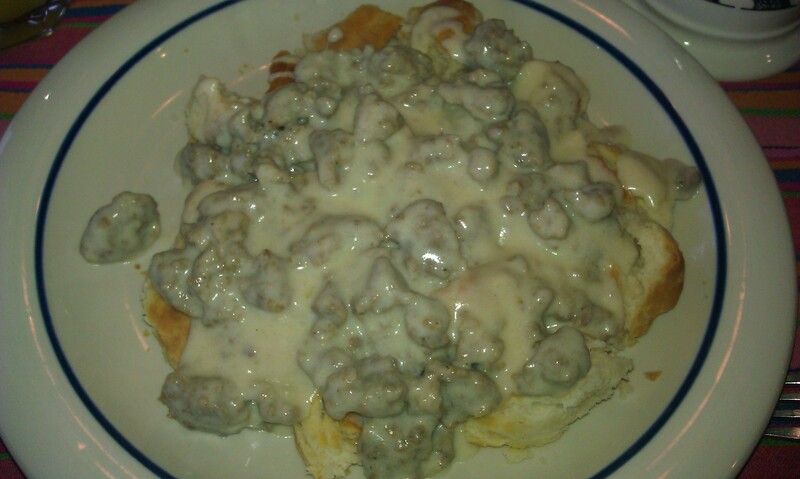 I mash my biscuits and put gravy all over them. It ends up looking like this. So there ya have it. My first recipe and blog post! I promise that future recipes will have more step by step instruction and exact measurements, but this one you just make with your gut. Just don’t make it too often or you will have a big gut! Previous PostPrevious Welcome to my food blog! Finally! Next PostNext You asked for it…Goulash!